Glass ArtWorks reusable artistic glass drinking straws are eco-friendly, safe, healthy, and come in fun decorative designs. Made of borosilicate (pyrex) glass, each BPA-free straw is exceedingly durable and meant to last a lifetime. Add excitement to your favorite beverages! Glass straws re-imagine the original simple plastic straw and come in a wide variety of colors, sizes, and artistic designs. Plus they make excellent and unique holiday gifts! Glass drinking straws re-invent the simple plastic straw and add excitement to your favorite beverages. Plastic is fast becoming a taboo material. Plastic straws end up permanently in landfills. BPA toxins from plastic straws can leach into your drinks and potentially cause health issues. Glass straws are reusable, encourage a more natural way of living and appeal to green and health minded people. 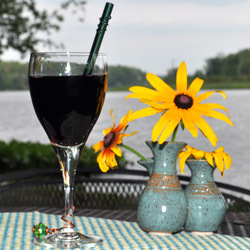 The glass straws also help avoid teeth stains when drinking dark liquids – such as from tea, coffee and red wine. Our glass drinking straws are made of durable borosilicate glass and come in a variety of attractive designs. Choose from decorative glass straws including colored ends, strips, flowers and dots in a range of colors. 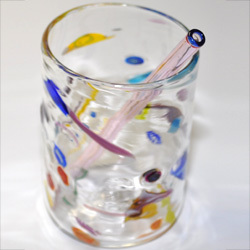 Select 6″ long straws for short glasses and 9″ long straws for tall glasses. Select straws with a wide diameter for thick drinks such as smoothies. Click here to see our handmade glass drinking straws. All our glass straws are completely dishwasher safe. Just rinse and place in the flatware basket of the dishwasher. If you wish to hand wash your straws, a free cleaning brush is included.